Born November 18, 1933, a native of Malone, NY, Fr. Mathias grew up and was educated in Troy, NY. After graduation from Troy Catholic Central High, he entered the Franciscan Order on July 14, 1956. He was ordained a priest in Washington, D. C., on March 17 1962. He was then assigned to St. Anthony Shrine , Boston, Mass., for a year and was transferred in 1964 to the faculty of St. Francis College, Rye Beach., New Hampshire. Besides his undergraduate degree from Siena, Fr. Doyle holds a Masters degree from the Catholic University of America and a Ph. D. in Political Science from the University of Notre Dame. 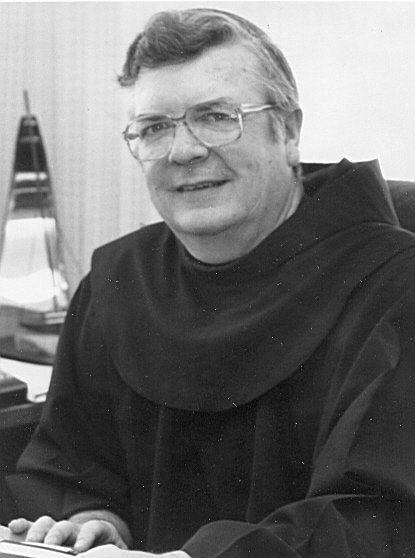 From 1965 to 1974 he was at Siena College as an assistant Director of Franciscan Students and then as guardian. In 1974, he was named to St. Bonaventure's Board of Trustees. He was formally elected president by the Board of Trustees annual meeting on October 10, 1975. As president Fr. Mathias saw many advances in the university and his fifteen year term in office is only shorter than that of Fr. Thomas Plassmann who served twenty-nine years. Fr. Mathias' administration witnessed the construction of the Mecom Center (now Murphy Hall), the Garden apartments and an addition to Plassmann Hall among other buildings. In 1990 Fr. Mathias decided to leave as president citing a desire to return to teaching and also saying, "I think now the institution is at a point where some long term decisions need to be made and it was unfair that I would not be able to see them through." PLACE OF BIRTH: MALONE, N.Y. This page was created by Kevin Lawless as part of an internship during the Fall 2004 semester. Any changes, other than minor editing, are noted at the bottom of the page.